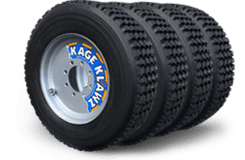 At KAGE Innovation, we don’t just settle for the industry standards, we have made it our goal to revolutionize the way snow plowing and pushing is completed. Minimize the time it takes you to get through the nightly snow removal routine and maximize the amount of commercial and residential properties you can clear through with our highly advanced and durable snow removal products. 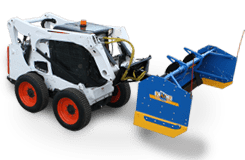 Get to the asphalt in one pass with our snow removal equipment. Our snow plow and pusher equipment is constructed with extreme durability and functionality. Are you sick of losing all that snow and having to go back around to clean it up? How about moving snow to one place, just to move it to the next? 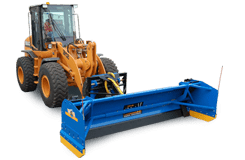 All of these common snow removal issues take both time and money, which is why we’ve solved these and many other problems with our quality equipment. 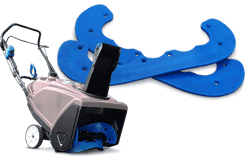 The KAGE Innovation products allow you to be more efficient with added snow control, a simple design, easy function and they can all take a beating – which is what winter brings each and every year. Don’t get hung up on a curbs or other obstacles, with the trip edge the worry of damages is greatly decreased. So you and your crew can focus on the task at hand, not nightly repairs. KAGE Innovation, (KAGE) guarantees for a trial period of 15 days from delivery, to the original purchaser, that the product will perform as described in KAGE created marketing materials or your money back. Prior to awarding a return authorization, KAGE reserves the right to discuss proper setup and use of the product with the purchaser or operator to ensure the equipment is being used as intended; which may require photographs of setup and use. The return authorization will be awarded only after proper setup and use has been achieved and the product does not perform as described. This money back guarantee reimburses 100% of the purchase & shipping costs. However, all return shipping and shipping arrangements are the responsibilities of the original purchaser. After speaking with a KAGE customer service representative, that has approved the return; the original purchaser will be provided with a return authorization number. Once KAGE has received the product, at the address provided, the refund will be processed. In order for the return to be valid, the original purchaser must have the product in transit to KAGE within 14 days from the issue of the return authorization number. Used on Skid Steers, Tractors, Telehandlers and Compact Loaders. Used on heavy equipment: Backhoes, Tractors, Telehandlers and Wheel Loaders. Proven to last at least 4 times longer than the rubber replacement blades used on many single-stage snow blowers. 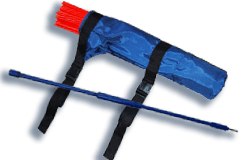 Our Snow Stake System includes a quiver,120 stakes and hole pounder. 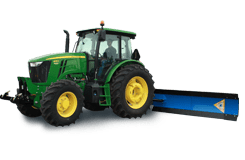 Designed for Tractors to allow great visibility over loader arms and improved center of gravity. 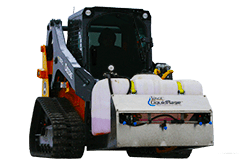 Designed for skid steers and tractors to help snow removal professionals pre-treat surfaces with anti-icing brine and chemicals. The amount of snow can be limitless, make sure you equip yourself with the same unending possibilities. KAGE Innovation’s equipment permits long lasting function, appearance, low maintenance and durable construction – all with universal mounts. Stack snow to new heights; see your customers, employees and family happier than ever and experience your business thriving like never before when counting on the superior performance of KAGE Innovation’s snow removal products. Get home early or have time to make more money when it snows with the help of KAGE Innovation.